Patrik Hellstrand, an entrepreneurial executive with broad experience working with lifestyle and luxury companies, is the CEO of by CHLOE, a plant-based and vegan fast-casual restaurant brand based in New York, NY. 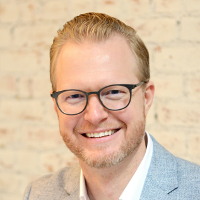 Having built his career in Hospitality, Consulting, Fitness, and Food & Beverage, Patrik has the unique advantage of being able to envision growth strategies and affect success by influencing his teams to mature beyond their traditional silos. As a leader, he cross-pollinates experiences from multiple industries and combines knowledge, expertise, and creativity to solve unpredictable, complex, and multi-dimensional challenges while maintaining his commitment to both revenue growth and customer-centricity. Patrik is also the founder and author of Thrive Wired (thrivewired.co), an original and curated content-driven site offering advice on tackling the challenges of excelling in a growing business while achieving a thriving life.